Why is Utah’s Alta Ski Area pushing for a tram up iconic Mount Baldy? 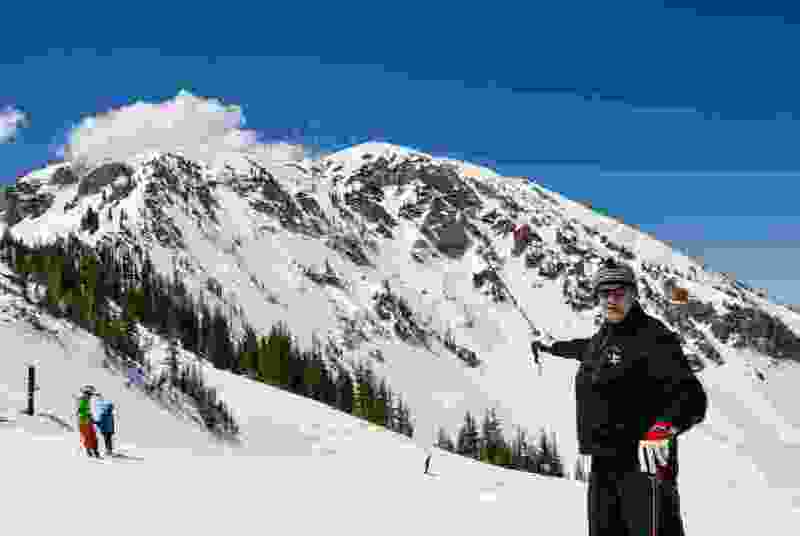 (Brian Maffly | The Salt Lake Tribune) Alta Ski Area general manager Mike Maughan explains the alignment for a proposed tram up Mount Baldy, one of the Central Wasatch’s most iconic peaks at the top of Utah’s Little Cottonwood Canyon. Alta says the lift would be needed to get ski patrollers on the mountain to control its many avalanche paths. But some skiers and environmentalists are pushing back, arguing Alta’s real goal is to expand its footprint in the increasingly crowded canyon. Alta • Mount Baldy presents some of the trickiest avalanche-control problems in North America. Twenty-three chutes fall from the rounded treeless summit’s north face, each posing a threat to Alta Ski Area’s Ballroom and connected terrain at the top of Collins Bowl. For years, workers at the popular Utah resort have used explosive projectiles fired from a 105 mm howitzer and nonrifled guns known as Avalaunchers to blast down avalanches. But now ski area managers fear the use of military ordnance may soon end and are looking for an alternative. With the blessing of the U.S. Forest Service, which administers much of the land used by the ski area renowned for its old-school charms and harrowing terrain, Alta insists the best option is a small tram that would ferry up patrollers to deliver charges by hand. 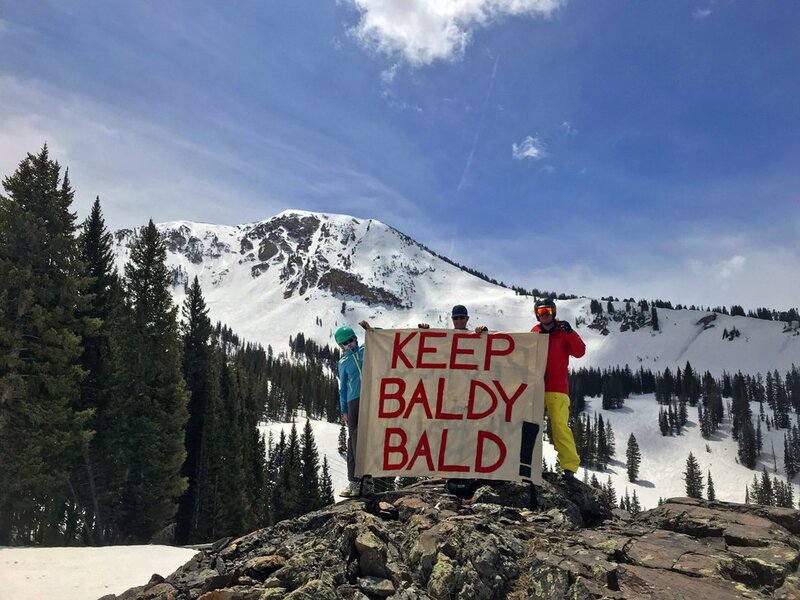 The proposal has sparked a backlash from environmentalists and even some of Alta’s own devoted skiers, who are campaigning to “Keep Baldy Bald” in a fight over Alta’s soul and identity as much as the fragile alpine environment in Utah’s Central Wasatch. But for Alta General Manager Mike Maughan, the tram could be a critical and unobtrusive addition needed to keep terrain open during and after storms. He understands the passion behind the movement to preserve Mount Baldy. “It’s iconic. It’s majestic. It’s a signature part of Alta. Many people consider it a rite of passage to hike to the top and ski the chutes,” Maughan said during a recent visit to Germania Pass under Baldy. His preference is to keep using the howitzer mounted on Peruvian Ridge to clear Baldy’s chutes. The Utah Department of Transportation also uses this spot to fire 10-pound rounds across the canyon to protect State Route 210. But the top of Little Cottonwood Canyon is the only place in North America where military ordnance is fired over inhabited structures, and federal authorities are not keen on preserving that tradition, which poses many hazards, such as overshoots, duds and premature discharges. Maughan’s rationale is under fire from those who see a tram as a potential Trojan horse that could ultimately wreck an iconic Wasatch peak. To see what Fisher fears, skiers at Germania Pass need only turn their gaze to the west, where hardly a mile away is a large new structure atop Hidden Peak, made possible by neighboring Snowbird’s famous tram. Maughan promises mountaintop development has no place in Alta Ski Area’s vision of the resort’s future, even though the company owns its summit terrain. The dispute ramped up over the U.S. Forest Service’s recent approval of Alta’s proposed master plan, which includes another new lift called Flora on the Albion side of Germania Pass, along with upgrades to existing lifts and skier amenities. The Flora lift and the Baldy tram would be Alta’s first new lifts that don’t replace existing ones since Supreme was built more than 30 years ago. Uinta-Wasatch-Cache National Forest Supervisor David Whittekiend sided with Alta after an environmental assessment concluded the tram’s benefits would outweigh its impacts. “The lift could also be used for skier access to the chutes below the tram or to the east and west Baldy areas when conditions allowed, increasing the stabilizing effect of skier compaction,” states the assessment, released this spring. Some Utah skiers welcome the idea. The proposed lift could move 150 people per hour, although expanding Alta’s footprint is not its purpose. The 1,900-foot-long tram’s lower terminal would sit just below Germania Pass and head up Baldy’s north face, or to the left if you look up from Ballroom. It would rise 600 vertical feet without a single support tower and land in a sheltered pocket below the summit. The tram would be powered entirely from the lower bull wheel and would require no additional structures. Alta could install lifts up Baldy’s north or east ridgelines without Forest Service approval because those alignments would cover Alta’s private ground, Maughan says, but the owners ruled out those options as too visually intrusive. For releasing controlled slides, ski areas are turning to new technologies that ignite methane, hydrogen and other explosive gases at fixed locations in avalanche starting zones. With Gazex, gas is piped to blasting platforms, while O’BellX uses portable pods filled with a hydrogen-oxygen mixture. Alta installed O’BellX on Baldy’s east face above a heavily used traverse connecting the Sugarloaf lift with Germania Pass last summer. But these technologies aren’t appropriate on the north face because there are too many chutes to protect. “This concentration of installations would disturb a substantial proportion of the area’s alpine habitat during construction and would permanently degrade its scenic character,” the Forest Service’s assessment states. If Alta loses the use of artillery, patrollers toting backpacks filled with 2-pound charges can always reach Baldy’s summit on foot, as patrollers have done for generations in the Cottonwood canyons. Alta officials say they have considered the Baldy question from every angle, and the tram offers the best solution. On average, Alta must perform avalanche control on Baldy 44 days a year, according to Maughan. That’s nearly every third day of ski season. Using a tram to get avalanche-control personnel on and off the peak quickly is not only safer than hiking, but it would also help open coveted runs sooner on powder days.